Ancasta International Boat Sales and Dickies International are joining forces in a new partnership to distribute the Beneteau power boat range. The All Wales Boat Show in Conwy has been praised for boosting the local economy – with the first yacht sold within minutes of the gates opening. One of North Wales’s best known businessmen will be thrown in at the deep end to raise cash for a charity supporting children with cancer. Conwy ready to make a real splash!! May 16, 2014 Comments Off on Conwy ready to make a real splash!! 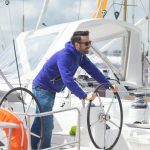 Thousands of sea lovers from across the UK will be flocking to Conwy on Friday (May 30) for the biggest boat show in Wales.